If you're having trouble deciding between a concrete fireplace and firepit, this video will help you make the best choice. 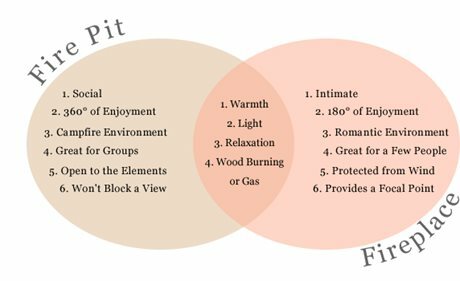 Deciding between a fire pit and fireplace is an important decision when creating an outdoor room. Both features extend the enjoyment of an outdoor living area by providing warmth, light, and relaxation. However, they have important differences that should be considered. Answer the questions below to find out which hearth style best suits you and your space. 1. How many people would you like your fire feature to accommodate? 1-4: A fireplace is perfect for just a few people. It provides romantic ambiance and encourages intimate conversation. 5 or more: A fire pit is ideal for entertaining a group. It provides 360 degrees of enjoyment and a campfire like environment. 2. Which best describes the overall mood you are trying to create in your outdoor living space? Intimate: A fireplace will create a cozy, romantic feeling. Social: A fire pit will encourage storytelling, laughter and s'more eating. 3. Does your property have a view you would like to take advantage of? Yes: A fire pit is low to the ground, and won't draw away from an amazing view. Position the fire pit in a place where the view can be enjoyed. No: A fireplace has height and mass, and will become a focal point in your space. Decorative elements such as a hearth and mantel can be added. 4. Is your property affected by wind? Yes: A fireplace is enclosed, making it easy to light even in windy conditions. Additionally, a fireplace can serve as a wind break that will protect guests. No: A fire pit is open and the flames can be more easily enjoyed. However, it will be difficult to light and enjoy in windy conditions. 5. Does smoke make it hard for you to enjoy a fire, or do you feel nervous or unsafe around an open flame? Yes: A fireplace directs smoke up and away from guests and is much less likely to produce flying embers. No: A fire pit is a great option, but be sure to think safety first. Always be aware when enjoying a fire outdoors.